An artist rendering of The Outfield at Cooley Law School Stadium set to be completed April 2016. Placemaking is a multi-faceted approach to planning, design, and management of public spaces that capitalizes on local community assets. The Outfield, an $11 million apartment project at Cooley Law School Stadium, is the latest development in the Stadium District. 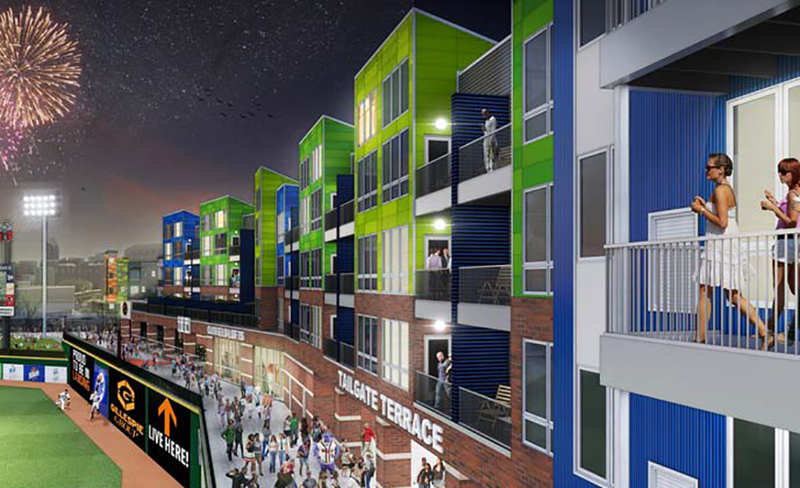 Developed by the Gillespie Group, the four-story building will have as many as 84 apartments when it’s finished by the start of the Lansing Lugnuts’ season in April 2016. Apartments will be built above a new fan concourse expected to open by June 1 in the outfield. They will include mostly one- and two-bedroom units. Six will be “micro units” of about 380 square feet. The Outfield is part of a two-year project to modernize the downtown ballpark. In April 2016, a $13.5 million renovation of the city-owned stadium will be complete, including updated scoreboards, seats, locker rooms, bathrooms, and concessions areas. The Gillespie Group has had a list of interested tenants since the announcement of the project.